SOME PEOPLE JUST DO NOT GET IT. They still think they can ignore the law and get away with it. And the local officials think they are kings of the island and they can rule it as they want. They think the issue of the Environment is just a romantic notion and not a life-and-death issue. Well, gentlemen and ladies, it is. Think of the many ironies. The national government had done its math. It is willing to spend P10-billion to build a world -class international airport in Panglao because it can attract 2 million visitors using the airport in return. If it has not dawned into some people’s thick skulls yet- it is the country’s first eco-airport, one of a kind that will be a model for which other airports of similar size and make will be patterned. For starters, some 2,000 trees will be replanted to replace those which had to be inevitably cut to give way to the airport that seats on a 220-hectare piece of property that dwarfs even the size of Mactan which is only 65 hectares. To make sure enough water is available- a single dedicated pipe from Bohol’s main island was even installed direct to the airport because water is essential to basic sanitation and hygiene. The DOTr made sure that its contractor the Chiyoba-MItsubishi joint venture and the Japan Airport Consultants structured an environmentally -sound airport that we can all be proud of. That means establishing a dedicated sewage treatment site for airport wastes, solar panels for one third of the passenger terminal, LED- generated internal lighting, natural ventilation from the island air and rainwater to feed the plants and other uses. Technology is state of the art with the tower control gizmos from Japan, radios from Germany and the meteorological equipment from Finland. A point was to be driven that this airport project cares for the environment . The least the Panglao LGU, the resort owners and other tourism stakeholders, and the people of Panglao and Dauis must do are to care for the environment in equal measure. It is a crying shame and sign of collective indifference that the exact opposite seems to be happening. 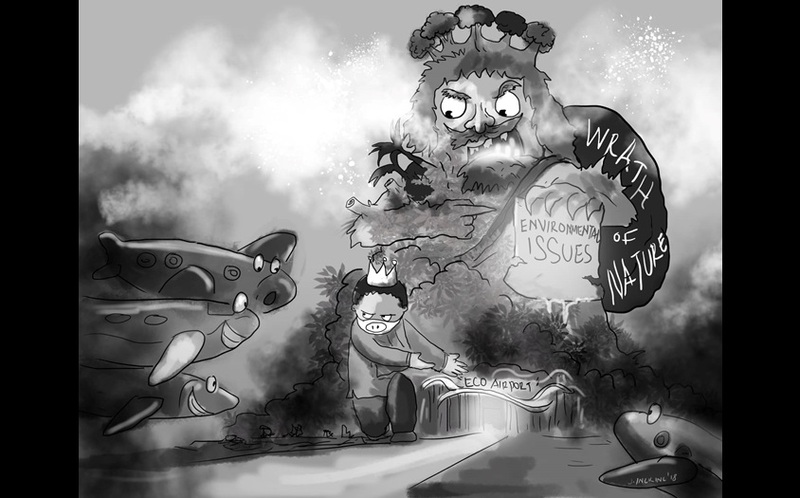 The Environment can go hang- while they do their merry, greedy, and capitalist ways. Early this year, the DENR ( Department of Environment and Natural Resources) had listed 400 violator establishments in the island and ordered the demolition of illegal structures and those outside the legal salvage zone especially along the Alona Beach area. With the stubborn stalemate on the demolition still on, we are four-square behind the DOT (Department of Tourism)Sec. Bernadette Romulo- Puyat in her announcing to the whole world that it’s “not safe to swim” in the sea waters off Alona Beach (the so-called mini Boracay of Panglao). Such an earth-shaking piece of caveat cannot be kept as “classified” information forever. The coliform content is already in an alarming proportion thus the ban to swim issuance in the Alona beach front was necessary and life-saving. Such a responsible secretary like Puyat will not issue an order based on an unfounded basis: that the bacterial content in the sea waters is no longer humanly tolerable to keep people safe when swimming in the area. The obvious culprit is that there is no adequate waste water amd sewage treatment facility in the area , so to speak. A previous findings of the DENR also showed that there are many illegal settlers in some mangrove parts of Doljo, Panglao and certain parts in Dauis- likely with even more inadequate sewerage systems and sanitation. On top of this, until now the town mayor has ignored the public clamor that pump boats (of every color, stripe and origins) should not be allowed to drop anchor in wanton abandon on the sea waters fronting the beach resorts. For endless times, we advocated to relocate these pump boats to a singularly- designated docking port where tourists can uniformly and orderly go if they want to go island hopping. So, what happened? Surely, during big events like the ASEAN confab, the Panglao mayor succeeded in bringing these pump boats a distance away from where they are docked now. We even found time to congratulate Mayor Nila Montero then and asked her to maintain the status order. But alas and alack, just two days after the ASEAN meeting, the boats were back to their original setting- bringing the same eye sore and dirt in the area. We are now reaping the consequence. All these acts of benign neglect and refusal to follow orders had resulted into this coliform issue. It challenges our credulity why the town mayor of Panglao can ignore such an order even coming from no less than Presidential Assistant for the Visayas Sec, Mike Mike Dino, who is speaking as an alter ego of President Rodrigo Duterte. The repeated order issued by the Department of Environment and Natural Resources (DENR) was similarly ignored by both Panglao Mayor Nila Montero and then Mayor Pedro Fuertes. By what unfortunate curse did we inherit such brand of local officials manning such a vital tourism town. ?More so – now that the Bohol Panglao International Airport is now operating and spoken on many Filipinos ‘lips. It is perhaps a blessing that elections are five short months away and people have to decide their fate one way or the other by electing the kind of officials they deserve. There are also other environmental concerns like the urgent need to preserve of the fast-deteriorating once a world class dive island of Balicasag. What about the other diving sites that Bohol was proudly known for -many years back? How kindly are we treating the sea-inhabitants for sight and show like our beloved dolphins and whales? What an irony ,indeed, that in just a few days after the international airport was opened, the Alona Beach area was ordered closed for swimming by the highest tourism official of the land? Enough warning this is. Or should we remind all about the ill-fate Boracay suffered with her six-months closure and cases filed against officials issuing business permits without the proper, complete environmental clearances and other violations. After Boracay, DENR head Roy Cimatu had categorically and publicly singled out El Nido in Palawan and Panglao in Bohol as next targets for a clean-up. Please, let us stop tempting the gods. Not all might survive the consequences of a massive government-directed clean-up drive. In Panglao, remember, the Environment is King. Bow to it.